Vous pouvez sélectionner jusqu'à 9 voyageurs. Découvrez le frisson d'une promenade en bateau à grande vitesse sur les eaux côtières de Punta Cana lors de cette visite en vedette rapide de Bavaro Splash. Conduisez votre propre bateau et faites de la plongée en apnée dans les eaux remplies de poissons tropicaux qui vous entourent. C’est le moyen idéal pour passer une journée à profiter de la beauté des Caraïbes! Ce tour en hors-bord Bavaro Splash est l'aventure idéale pour les voyageurs épris d'adrénaline! Prenez le volant de votre propre hors-bord et survolez les eaux cristallines des Caraïbes dans cet incroyable voyage à Punta Cana. Découvrez les merveilles de la plongée en apnée parmi les récifs de corail et les poissons tropicaux après les instructions de votre guide local. Savourez des boissons sans alcool sur la plate-forme de plongée en apnée tout en absorbant le plus de soleil possible avant de retourner à la plage. 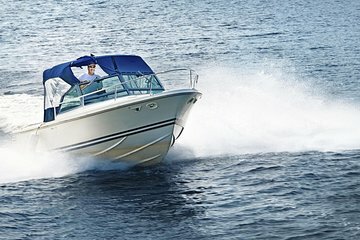 Pour assurer votre sécurité, le tour en hors-bord est supervisé par votre guide professionnel à tout moment, ce qui signifie que vous pouvez vous détendre, vous détendre et profiter du frisson de la croisière en eau libre sans souci! Remarque: l'âge minimum du conducteur est de 18 ans. Le transport est inclus uniquement depuis / vers les hôtels situés dans le centre de la région de Punta Cana. It took a little while for everyone to get gathered and get the tour started, but once it did, everything was awesome from the speedboat to the SNUBA experience. Only thing I would've changed would be the freedom they give you with the speed boats. It's basically follow the leader in a circle. Overall though, definitely a fun tour and worth the money for sure. Although we had purchased the tickets prior to arriving in DR, when we went to confirm the pick-up time our names were not in the system. We spent an hour calling different entities with the tour coordinators at our resort, Punta Cana Princess Franklin and Jose are amazing for having put up with this to try and rectify the issue for us. In the end, we weren't able to take the excursion although we had bought the tickets in advance because we were only able to be fit in at 8am when we already had another excursion booked. I will note, however, this is not the fault of Viator but rather whoever the third-party was. It was very disappointing to say the least. Great excursion!!!! Staff was very friendly and everything was well organized. The only thing we did not like is the small speedboat drive: you do not discover anything as we thought we were going to do. You just drive back and force in circle for 15 minutes. Snuba diving is a must do and it was a great experience. I already submitted my comments to Viator via phone. PS...the picture represented on this tour is NOT representative of the boats used. Lots of fun! SNUBA was unique, interesting experience. Lots of time in the water. Friendly staff. Speedboats fun too, a little old but work just fine. Melhor de todos os passeios. A possibilidade de pilotar uma lancha é uma experiência diferente e muito interessante. O mergulho é sensacional. O único problema que tivemos foi quanto ao DVD do mergulho, que compramos e não recebemos no hotel como fora prometido. O tour inclui 3 tipos de atração: passeio num barco veloz tipo um jet ski, com um banco onde o motorista e acompanhante sentam lado a lado e voa sobre as águas deliciosas do Caribe. Depois você mergulha no máximo a 6 metros de profundidade, com oxigênio, e em seguida faz snorkling. A fauna é maravilhosa. Leve câmera, se tiver, a prova d´água, filtro solar e toalha. O passeio dura aproximadamente 4 horas. Wonderful time! Snuba instructors were delightful! We had problems booking this trip because it was one adult and one child in two different boats. There wasn't a way to do it online and even when we called it was an issue. But we thought once we got it resolved via phone it wouldn't be an issue. Well, when we got there, we had our vouchers. Problem was it only said "one adult"...there was no child on the voucher. It seemed like it was an issue but it eventually got worked out. The snorkeling was ok. The reef isn't very colorful nor does it have a variety of coral or fish. The snuba was great! Because I'm a diver, I was able to go down with a guide solo with him. That was great! The speedboats were fun too. Overall it was a good experience and I'd probably do it again. I just don't like trying to be proactive and do things right before I travel then have to deal with problems once I get there.